Sand bass. Aka white bass. My first impression is sandbass as well. But a closer photo sure would be nice to be 100% sure. What lake were you fishing? I was fishing Somerville, yea the photo isn't the best. 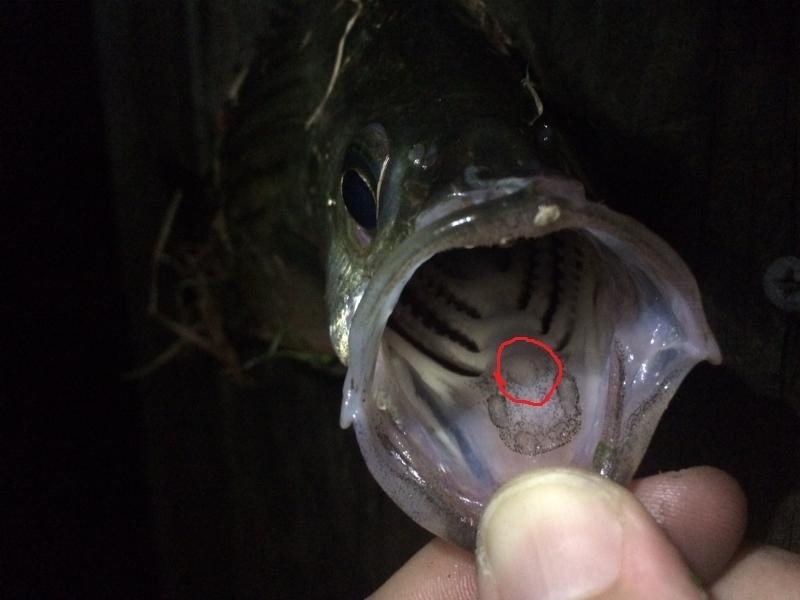 Why would it not be a striped bass? 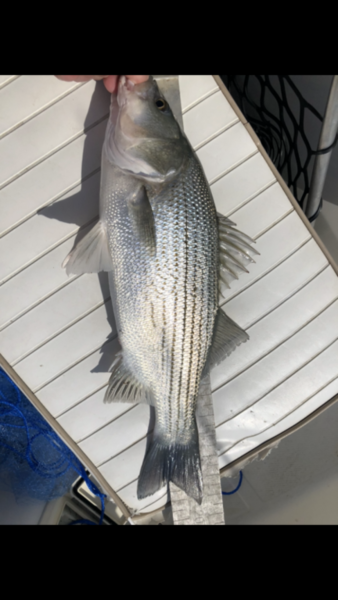 Well, so far as I can tell, there's been no stripers stocked in Somerville, but it does get hybrids pretty regularly. 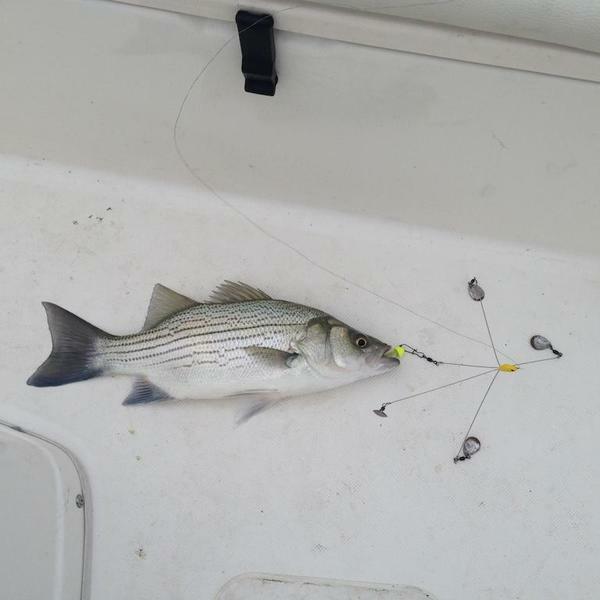 Not sure if you're asking about stripers or hybrids. 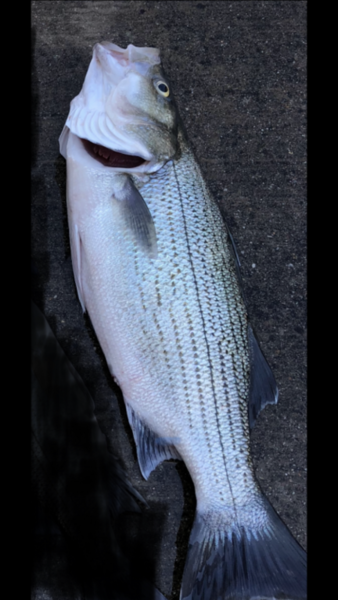 Striped bass are far more elongated, with much more prominent stripes. 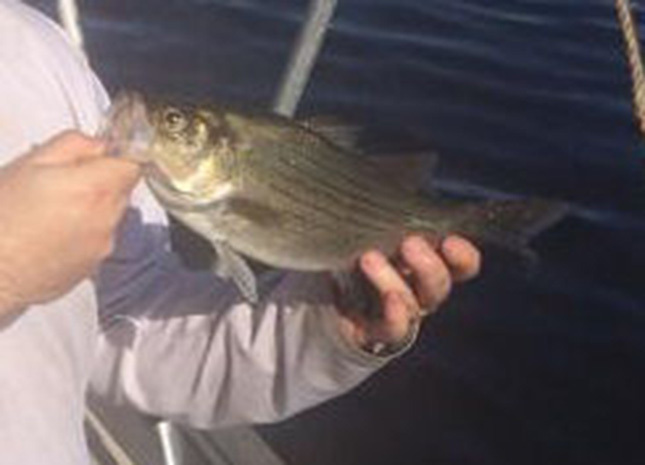 Hybrids are deep-bodied like sandbass, and generally have multiple darker (sometimes 'broken') stripes. Sandbass tend to have one dark stripe and the others are lighter. But their eyes are larger in proportion to their body size than a hybrid usually is. The key test is to check the center tooth patch. If it's triangular, it's a sandbass. If it's elongated and split, it's a hybrid. I have been catching several of the new crop of hybrids released into Somerville this year. That looks about the size so it could be a hybrid as well. Last edited by J-Moe; 10/20/17 12:00 PM. If in doubt and the fish is not 18 inches, toss back and repeat. Intel curve can be very costly not only in $ and cents but in our future game management ! Sometimes it can be hard to tell when they are the size of a white bass. 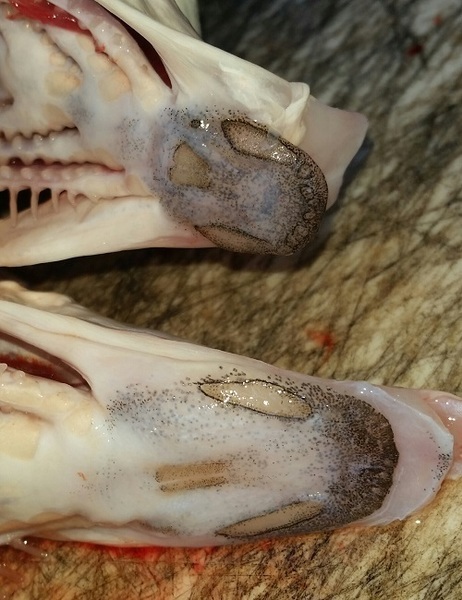 One of the best ways to properly identify the fish is by looking at its tongue. There is an off white/pale area that is call a "tongue patch". On white bass there will only be one small patch. 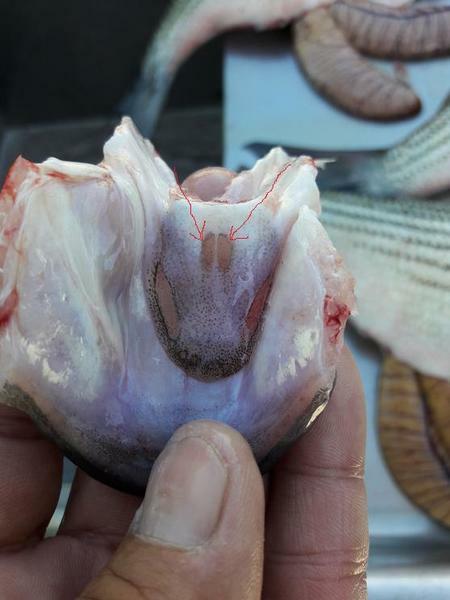 On a hybrid or striper there will be two tongue patches that look almost like a deer foot print. 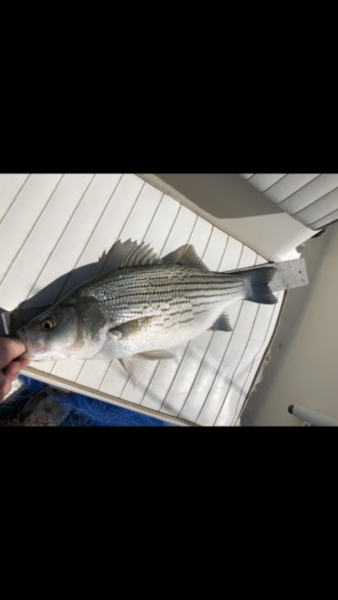 I remember which is which by thinking white bass are small and only have one tongue patch, hybrids and stripers are bigger and have two tongue patches. Last edited by RespectTheFish; 10/20/17 05:47 PM. 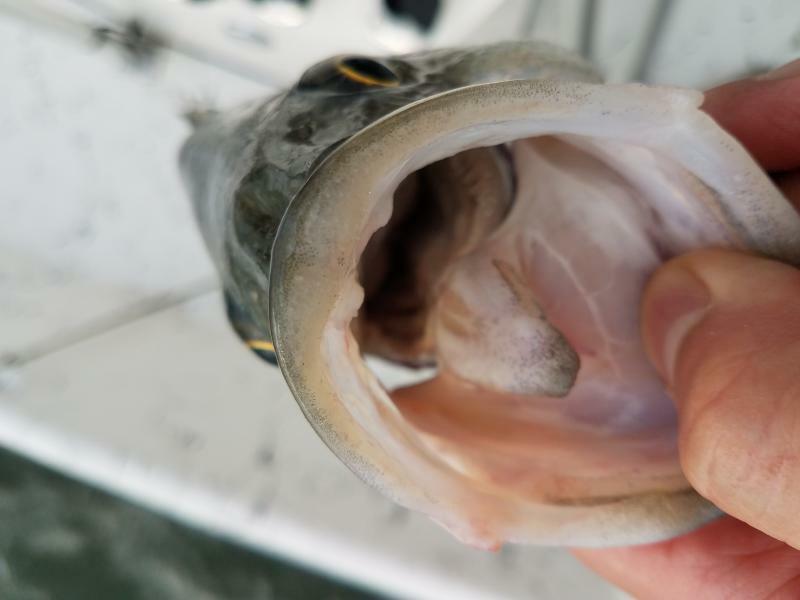 If it calmed down when you held it then it is a sandbass if it keeps fighting its a hybrid. Best way is tongue patch! Hybrids is also known as wipers up north. Cigga, that's an awesome chart. 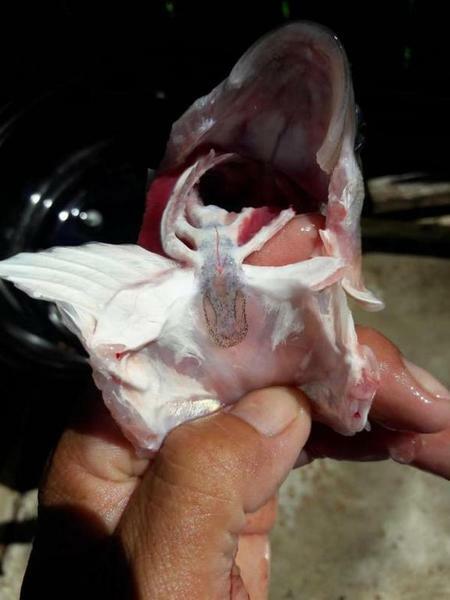 Guys, I'm going to sticky this topic, as it's something that comes up on a regular basis and every new angler could use our help on fish identification. how was the lake level? 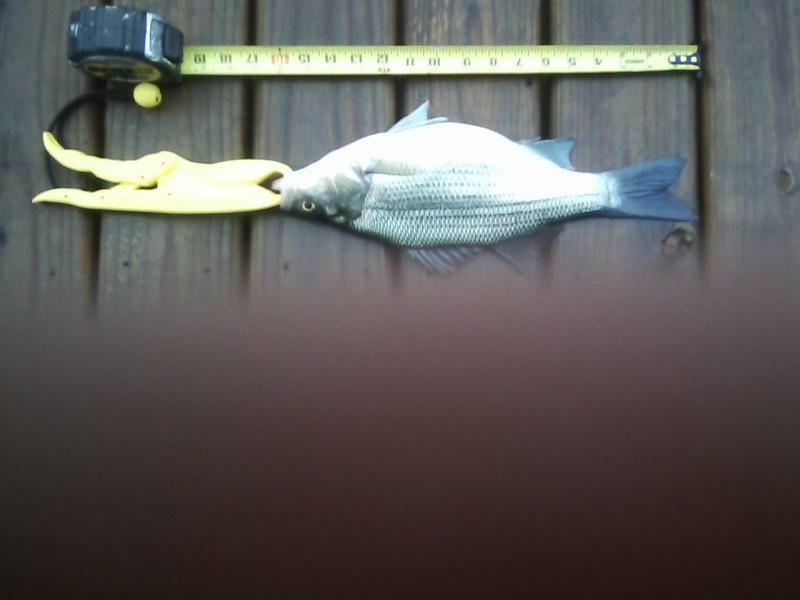 Its hard to tell but it does appear to be a white bass. But if it has really dark lines and a yellowish color it could also be a good sized yellow bass. A pic of a yellow bass should be added to the ID chart as well with the other 3 fish. Sand Bass. Young Hybrids are very bright Colored fish. Some will have a blue tint to their backs. Fish pictured is very dull...."Sand" colored. Last edited by BridgeportGuide; 10/23/17 11:44 AM. Does anyone have real tooth patch photos of a white vs hybrid? 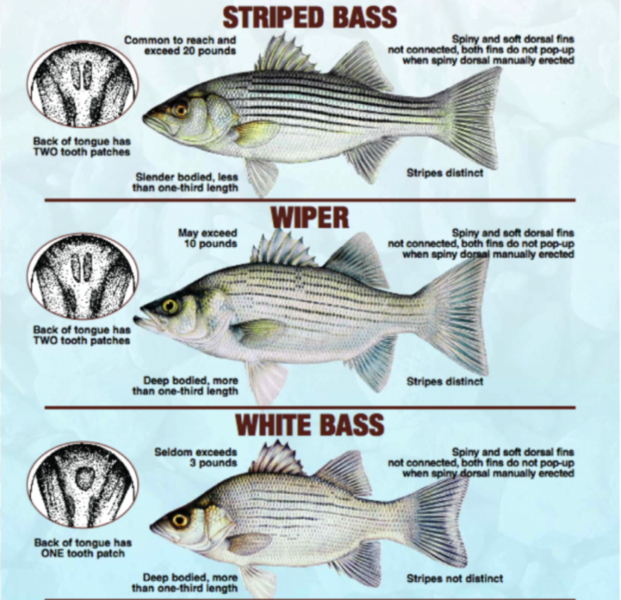 They get "Wi" from white bass and the "pers" from stripers. Put it together and you get "Wipers". A lot of folks in other states call them wipers. Threw me for a minute when I heard it the first time too. I work with a guy born and raised in Kansas. He asked me what we meant when we said “Hybrids”. When I told him he immediately called it a Wiper. Thanks! That's a white bass, right? That's what I was leaning towards, but it was dark and I've never caught them before so I figured I'd ask and make sure. I was taught that if the lines on the side are solid, its a sandie, broken lines are hybrids. Either way, here on Fork, they go in the livewell for fertilizer. Not at all accurate unfortunately, sand bass have broken lines (including the lateral line sometimes). 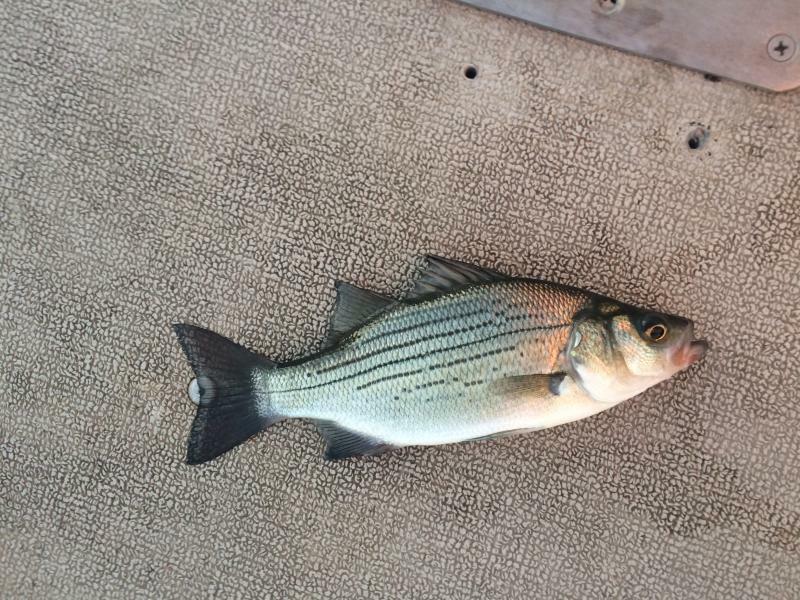 Catch Lake Lewisville sand bass and you'll have broken lines on every single fish. Wish we could tell from the lines though! It'd be super easy. Definitely a sandbass and a very good one too. Fish Lake Limestone for Sandbass and you will quickly learn to throw the old, one solid line, broken lines, 2 lines, etc etc rule right out the window. When Lake Limestone was so low for a few years that all the ramps were out of the water, the Whites got really big and had a couple extra years of age on them. 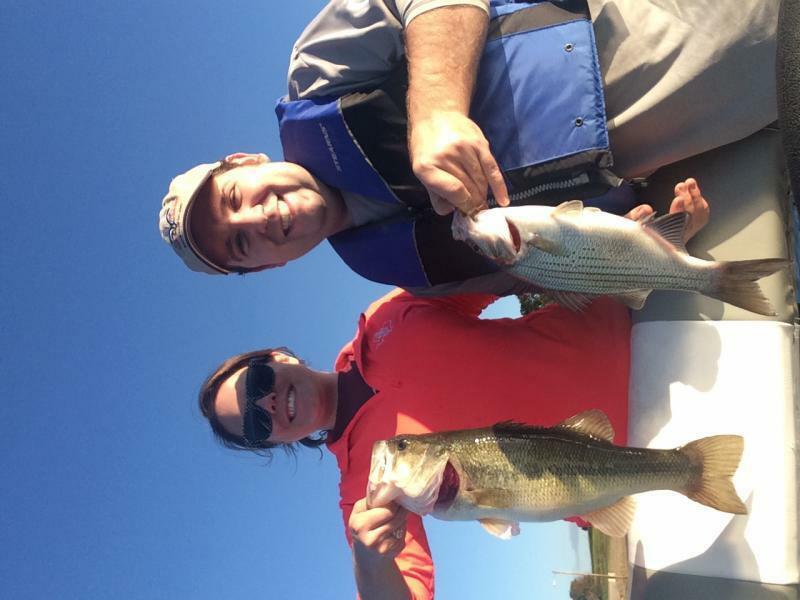 Many of us would swear we were catching close to 3 lb. 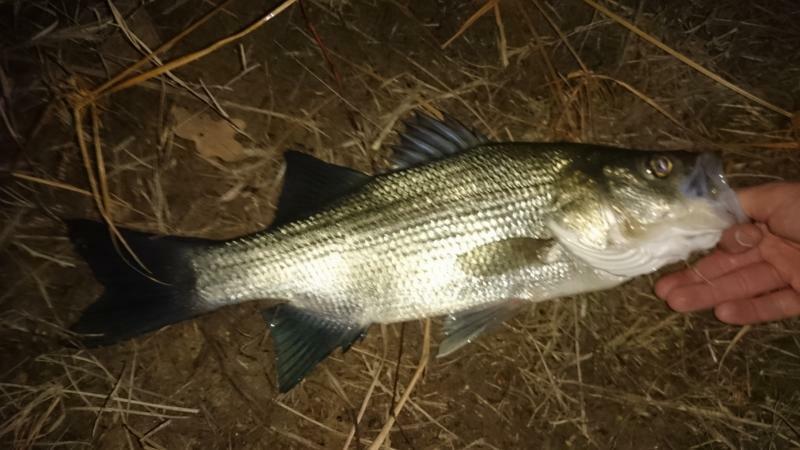 small Hybrid when the lake filled back up. But there are none in the lake. Older Whites will start looking more like small Hybrid. The tooth patch is the best way to check. And if that's unclear, throw em back. 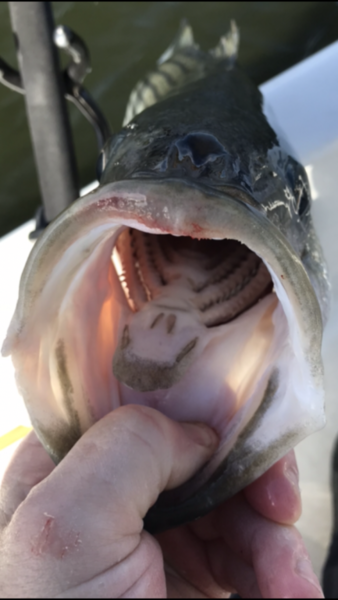 I posted about a crazy and productive long weekend of white bass fishing on another post, about 40 or 45 very large white bass averaging around 16", gravid females always looked close to popping. I caught a crappie and 4 or so LMBs, too. So, I sent a few photos to Dr. Richard OTT, Lake Athens' TPWD representative to let him know they were sure healthy this year. Dr. Ott responded by mentioning that since Lake Athens isn't on a big river system, not even many creeks of any size, that there are few spawning opportunities of those sorts to run up in, say like the Neches north of Lake Palestine. He went on to say that when "interspecific" competition is very low, that is, for this species, there aren't hundreds of thousands of them like on some other lakes, that while the density is much lower, he noted the quality (size) is often greater. 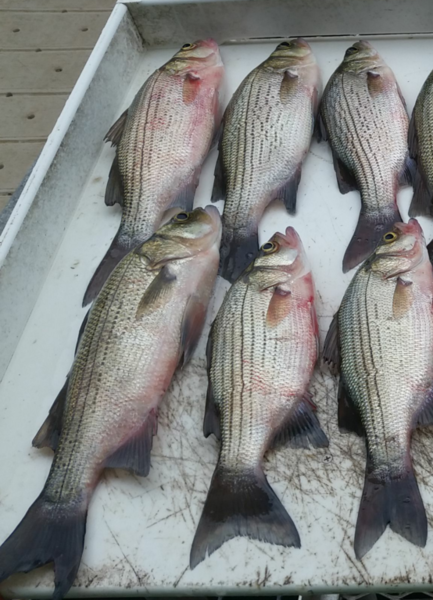 Dr. Ott confirmed that in the absence of rivers to run up, white bass will look for wind swept shallow water with desirable bottom features. This is what I have . . . about 50 feet directly in front of my boathouse! I just went down over lunch, bored, made just a few casts. Very light drizzle, no wind or wind blown waves we get up here in the cove, not the best time of day either . 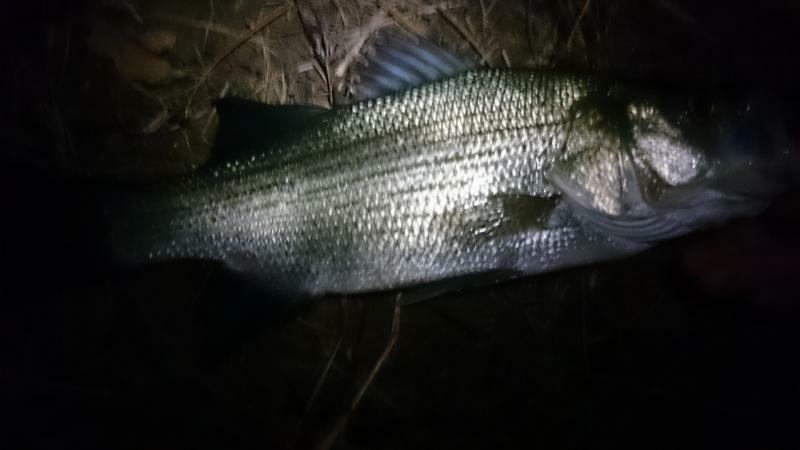 . . but I caught 2 small LMBs and one female white bass right in my average length zone from this past weekend, approximately 16". 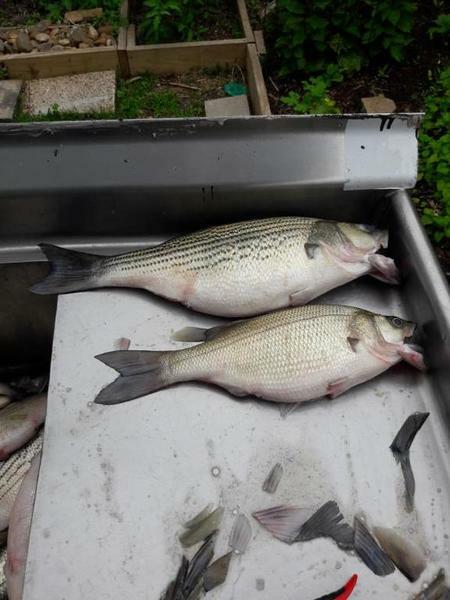 The moral of the story is on healthy lakes without big rivers and creeks creating running water and currents, etc., there likely won't be as many white bass but the ones that you catch might be much largerif the lake is healthy with good food sources. Quality over quantity! The ones I caught a few days ago look like they could literally feed on the white bass in Chandler up on the Neches River. Here's a better pics. 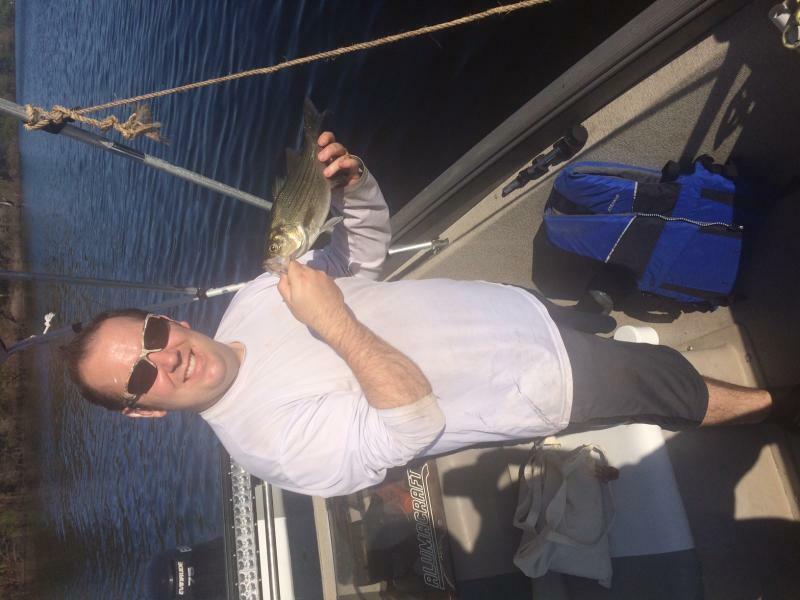 This one is a white bass with a single tooth patch. Red arrow pointing to tooth patch. Tooth patch almost shapes like a heart. Last edited by brucevannguyen; 05/03/18 01:02 PM. 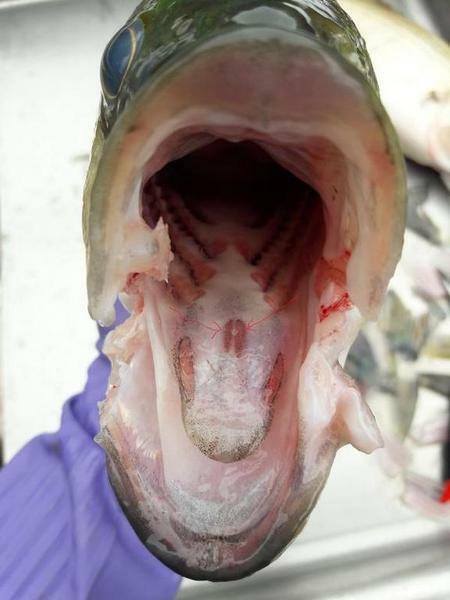 Here's a hybrid with two tooth patch. Big or small hybrids will have two tooth patch. Patches looks like deer hoof in the sand. 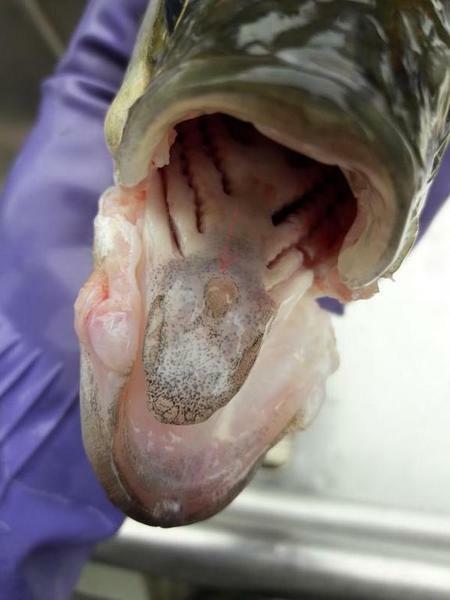 The younger hybrids double tooth patch may look slightly translucent but the patches are there. Last edited by brucevannguyen; 05/03/18 01:11 PM. Here's both fish side by side. These are awesome pictures thank you so much! Send them to TXFWD! These are way better than their posters! Both of these are hybrids. This is why checking the tooth patches are so important. I am not an expert (i started this post). For the picture a few post ago, I am not certain. The lines aren't pure solid touching the tail, which leads me to think white. But i would look at the tooth patch plus other factors to decide. Tooth patch has helped me out a lot. Last edited by plk1122; 05/18/18 04:55 PM. Wish the photo were better resolution. My first impression is small hybrid. Don’t know why but I find Somerville bass are hard to tell sometime because there are some monster white there. Some I have to checking over and over to make sure it’s a white. If any doubt I ask whoever catched it to threw it back. This always cause a arguement but few second later they would forget because busy fighting another bass. It’s never worth it if there any doubt. 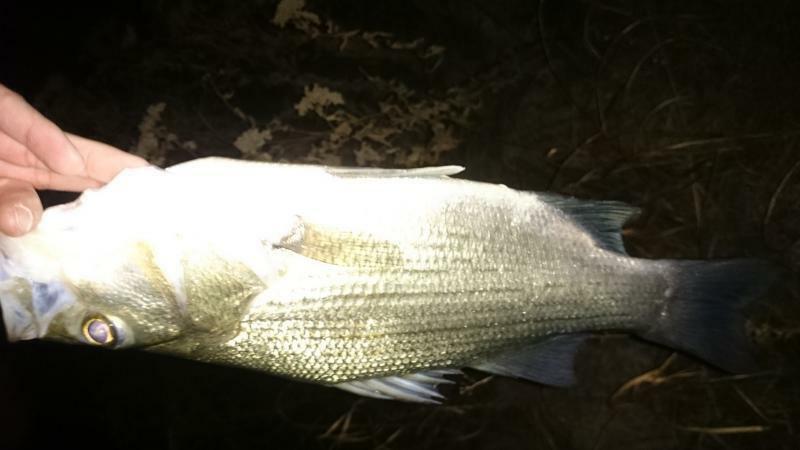 We regularly catch White Bass Hybrid at lake Somerville that stumps everyone. So I thought I would present it you guys to see what your thoughts are. On legal size WB and equal size Hybrids IMO they are very easy to tell apart before I even look inside at the tongue. But we have a fish that grows to 16", that has all the traits of a WB except the bone structure is huge and the fillets looks like 2 strips of bacon. A standard issue 14" WB will have twice the weight in the clean fillet in comparision. The other exception is they have very dark color. They are really green on their backs. I called a LMB on one Saturday because it was so green. Anyway here is a picture of one...lower left in the photo. The WB beside it is roughly 12". The one on the bottom left just looks like a chunky sandbass, and the one on the top right looks like it could be a hybrid. That's just it...it's all bones. The fish to the right will yield double the meat of the one on the left. 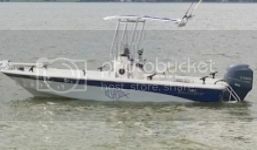 Our WB on Soverville have a lot of stripes but the tongue checks out. I check them all. Also notice the pectoral fin and the gill cover are much darker (green)...it's hard to see in the picture but the back has a lot of green on it. Last edited by CaptnC; 10/10/18 10:18 PM. I've had the game warden argue that tooth patches mean nothing. After whipping out the book and showing him that's what the state says, he left me alone. I can't do a dna test on the water.